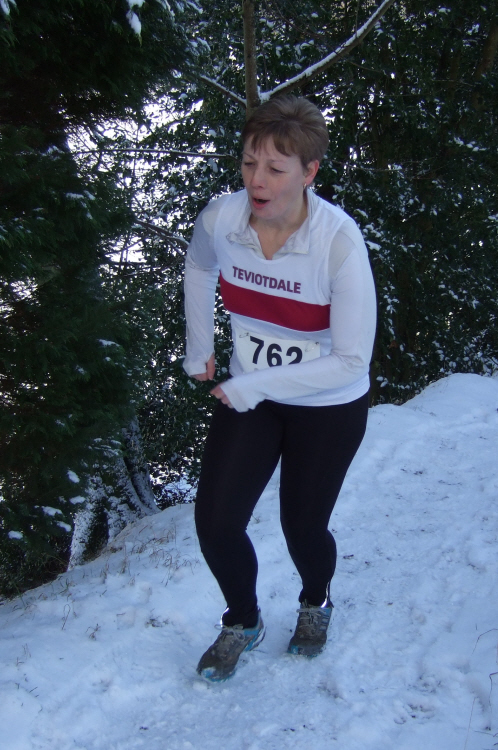 Teviotdale Harriers held their previously postponed Menzies Races on Saturday 22 January. The first race of the day was for both u/13 boys and girls. 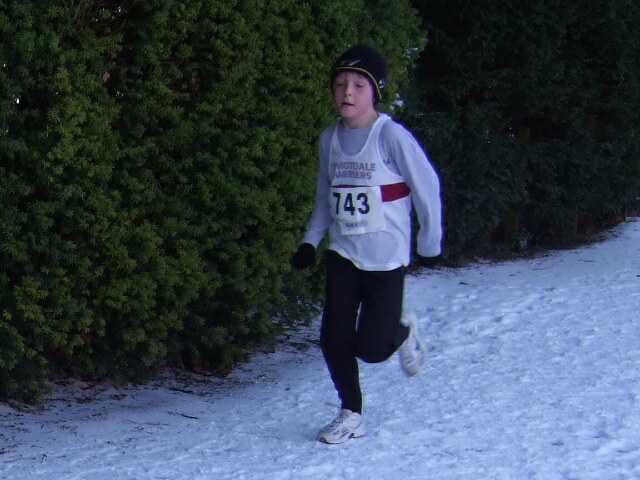 In the boy’s race Callum Murray romped home in first spot in the time of 11:57, in second place it was David Mercer [12:35] and in third it was Kieron Pringle [11:04]. In the girls race young Emma Grieve [12:26] finished just ahead of Iben McMilan [12:35] with Eilidh Jaffray in third place [12:54]. The second race of the day was for u/17 boys, u/15 girls and sen ladies, first to cross the finish line and claim the Lunn Spence trophy was young internationalist Louise Mercer [18:37]. Louise also won the sealed handicap which was incorporated into the race, in second spot was Joanne Gilfillan [19:05] and in third was Zoe Williams [19:28]. Kyle Potts won the u/17 boys race in the time of 19:29, in second place was Keith Learmonth [20:18] and in third it was Charlie Marshall [22:57]. In the sen mens race for the Menzies Trophy it was Raymond Jaffray who claimed the silverware in 24:05 with Craig Grieve in second [24:11] and coming home in third was Keith Murray [24:17]. 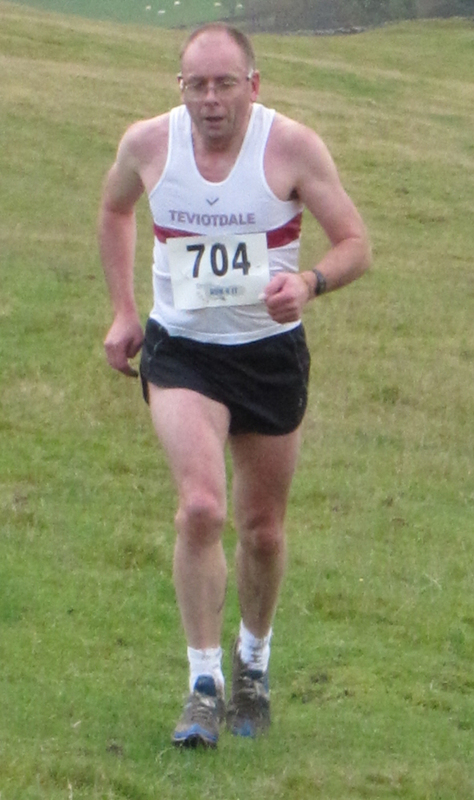 The fastest actual time and winner of the Oliver Trophy was Kelso’s Colin Welsh. 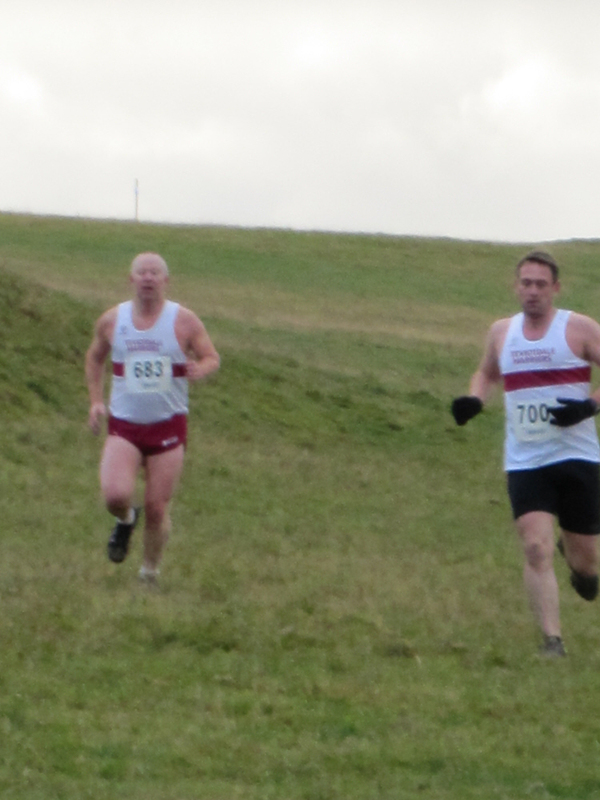 Teviotdale Harriers held their annual Langheugh Races on Saturday 8 January. 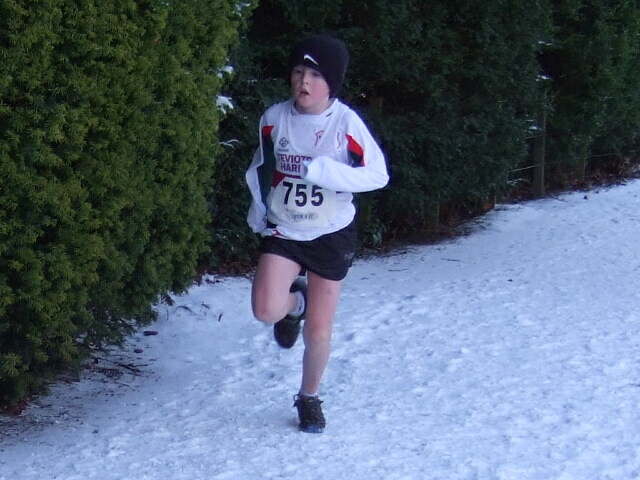 In the first race of the day for u/13 boys and girls over a course in Wilton Lodge Park it was young Jedburgh athlete Gareth Williams who crossed the line in first place to claim the Burnfoot Residents trophy winning in the time of 12:29 in second place was Callum Murray [13:10] and in third spot it was Jamie Waugh[13:22]. In second spot over all and winning the girls race and with it the Fire Brigade Cup was Ishbel Inglis who won in the time of 12:43 in second place was Molly Marshall [13:19] and in third spot it was Emma Grieve [14:06]. In the second race of the day over a course that takes in Wilton Dean, Scaw Mill, Trim Track, the winner Pam Paxton [21:57] claimed the Lodge 111 Trophy [ladies] with Jedburgh pair Joanne Gilfillan [22:04] and Zoe Williams [22:35] second and third respectively. 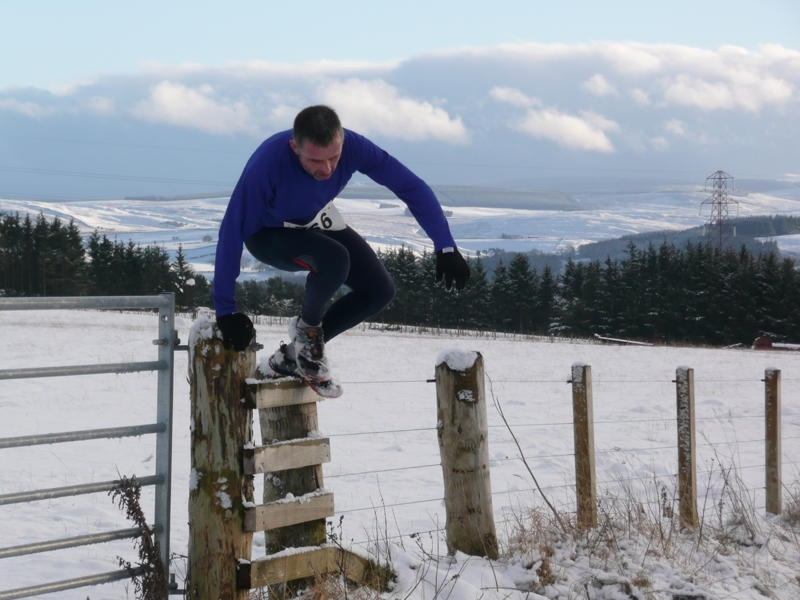 The sen mens race over 5 miles of tough border countryside which takes in Scaw Mill, Whithaugh Moor, Wilton Burn, Bortough Covet, was eventually won by Kelso’s Colin Welsh [51:03] second was twice previous winner Craig Grieve [51:14] and in third place was Kenny Short [51:26] when asked afterwards if this was the hardest race he had ever won Welsh replied “Yes and it was also the toughest I have ever run”. 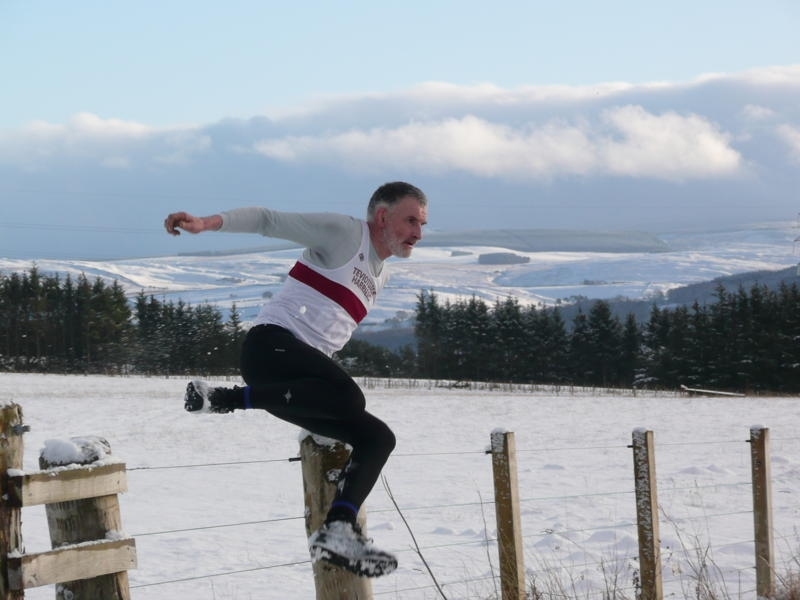 Since 1987 Alan Coltman has completed 24 out of 25 Langheugh races ~ only missing the 1991 race. Teviotdale Harriers held their annual Burns Club sponsored races on Sunday, with the sen men getting a chance to go off first, it was G Law who was to set the pace and was still in the lead when the runners came back into view but by this time the pack were closing in with scratch man Colin Welsh hot on Laws heels and with the winning line fast approaching Welsh sailed passed and went on to win in the time of 17:16, in second place it was Raymond Jaffray 17:20 with Derek Scott coming home third in 17:21. The second race for u/13 girls and u/11 boys, with just one mile to be covered it was always going to be fast and furious when it came to the finish it was Emma Grieve who was in front, winning in the time of 9:15, next to finish was the boys winner Jamie Waugh who finished in the time of 9:21, next home was Iben Mcmillan 9:32 and in third spot it was Mhairi Inglis 9:47. Second home in the boys race was Gareth Williams 10:10 and running home in third spot was back marker Calum Murray 10:43. The main race of the day for the Burns Club trophy was competed for by u/17,15,13 boys, first run for in 1967 and was won by T Dagg, this year it was won by Charlie Marshall 17:29 who was defending the trophy he won last year, in second spot it was Kyle Potts 18:18 and completing prize winners in third place it was Harry Marshall 18:40. With the sen ladies covering the same course it was Ann Renwick who stormed to victory in the time of 18:28, in second spot was the fast finishing Joanne Gilfillan 18:31 and in third place was vice president Sylvia Grieve 18:38. The presentations of the trophy’s were then held in the Hawick Burns Club where refreshments were laid on. 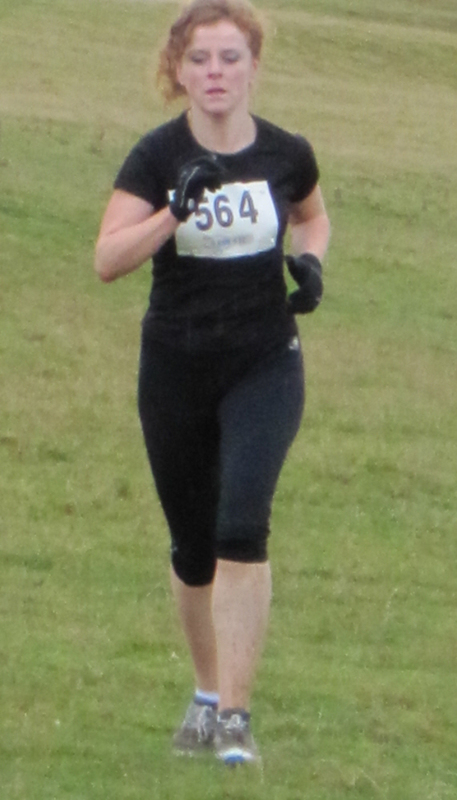 Teviotdale Harriers held their second club race of the season the Jubilee Trophy race. The next race on the card was for u/17 boys and u/17 girls and sen ladies, the u/17 boys race was won by Keith Learmonth [25:35] with Kyle Potts in second place [26:50]. In the sen ladies race Zoe Williams romped to victory in the time of 26:07 with Eilidh Inglis second [26:19] and Ann Renwick [27:43] finishing in third spot. The main race of the day was for the Jubilee Trophy first competed for in 1939 when the winner was B Smith, this years winner was Keith Murray who completed the course in 27min 23sec, in second place it was Craig Grieve [28:20] who had previously won the race twice in 2007 and 2008. In third place it was Michael Yule [28:32]. 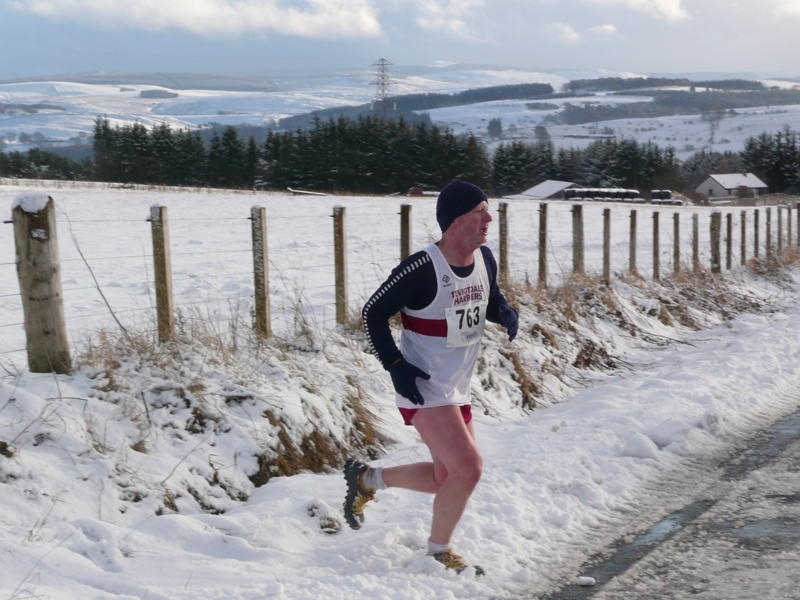 Congratulations to Bill Knox who ran at Cumbernauld in the relays on Saturday 23 October 2010. This event was a major milestone in Bill’s running career. 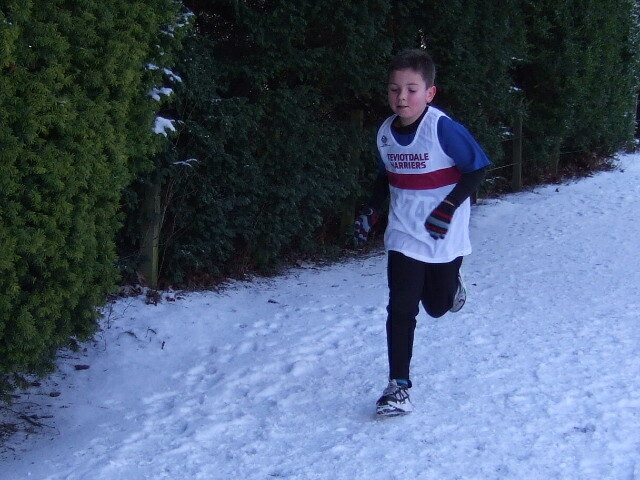 He completed his 700th race, a fantastic achievement and a great example to younger runners. Louise Mercer has been selected to represent the East District at the above championships being held in Birmingham. Louise will be up against the best athletes from the whole of the UK and we wish her well. She travels down to Birmingham on the team bus on the evening of Friday the 12th March 2010 and stays overnight with her fellow team mates and competes on the Saturday.